A political spectrum is a way of looking at where political ideologies, parties, politicians, and thinkers stand overall. There are many different ways of doing this. The most common is the left-right spectrum. or something similar. In the U.S., the “left-wing” is often associated with the term “liberal” (Note: When I say “liberal”, I mean American liberalism, which is associated with left-wing ideas.) and the right-wing, “conservative”. However, the terms liberal and conservative do not usually refer to far-left or far-right groups. I will go through the different positions one by one. I will also list active American political parties that have that position (this will not include political organizations that don’t run candidates for office. For complete lists, see Political Parties and Marxist Parties and Organizations). The fiscal far left wants the most government intervention in the economy. Adherents to this idea include communists and Marxists (except neo-Marxists). The far left is often identified with communism, though there are exceptions, such as the Marxists mentioned (and, on the social spectrum, some more radical liberals). (Another note: all of the “-isms” and other political groups will be explained in the page Political Definitions.) Some Strasserites are also fiscally far left. The fiscal left wants significant government intervention in the economy. Adherents to this idea include non-Marxian socialists, democratic socialists, social democrats, and some feminists, environmentalists, and various other liberals. Strasserites are also fiscally left-wing, though some go as far as being far left. Left-wing “liberal” economic policies often have a basis of the desire for equality for all, and, more specifically, include higher taxes (most often for the rich only), an idea of shared wealth, fair trade above free trade (though this is a close debate in the left), and distrust of big business. The fiscal center-left holds a moderate position on economics, though leaning towards the left (see Fiscal Left). Adherents to this position include some feminists, some environmentalists, and some various other liberals, as well as a few libertarians. Hitler’s economic policy, although very unclear due to his lack of interest in the subject, could be considered to be somewhere on the left towards the center due to his incorporation of the idea of government-owned big business. However, he starkly opposed communism and capitalism. To add on top of all this, Hitler secretly let many corporations do what they wanted. He considered his type of socialism (“National Socialism”) to be unrelated to Marxian socialism (in a similar way but very different circumstance, the old Shaker communities could be considered socialist but unrelated to Marxian socialism, because they were a traditional religious conservative group that shared all their possessions and emphasized the community over the individual). The fiscal center holds a firmly moderate position on economics, neither leaning left or right. This may include taking equal amounts of ideas from the left and the right, or not addressing the issue at all. Adherents to these ideas are referred to as fiscal centrists. The fiscal center-right holds a moderate position on economics, though leaning towards the right (see Fiscal Right). Adherents to this position include neoconservatives, some Christian and religious conservatives, and some various other conservatives, as well as some libertarians. Conservative economic policies often have a basis of a desire for equal opportunity for all, include lower taxes, an idea of earned wealth, free trade above fair trade (although some conservatives, like paleoconservatives, oppose free trade, seeing it as increasing the country’s dependence on foreign nations, and support economic nationalism), fiscal conservatism (usually) (another note: fiscal conservatism should not be confused with economic conservatism, which applies to economic and fiscal policies on the right), and acceptance of big business. The fiscal right wants little if any government intervention in the economy. Adherents to this idea include paleoconservatives, some Christian and religious conservatives, and some various other conservatives, as well as most libertarians. The fiscal far right wants the least government intervention in the economy. The economy would be absolutely unrestricted. Fiscal far right advocates include anarcho-capitalists. There are no notable fiscal far right political figures or groups in the United States. An example of an internationally famous fiscal far right politician would be Chile’s General Augusto Pinochet, ex-dictator. The social far left is differentiated from the social left in that it is more radical, advocates quicker change, especially in society, and often does not wish to bring about said change through electoral processes or democracy. Rather, social far left advocates wish to use force to bring about change. Once the change has occurred, most communists end electoral and democratic processes (Lenin’s democratic centralism guaranteed fair debate until the party decides on an action, but in reality, ruling parties often eliminated this) and ideally see war as pointless and evil. The lack of war, however, does not mean the absence of a dictatorship, executions, political prisoners, or fear being used as a tool, although Trotskyists, Left Communists and Marxists are traditionally against the latter three occurrences and Left Communists are against authoritarianism. Trotsky himself advocated fear as a tool, but modern Trotskyists tend to be a bit more moderate. Adherents to this position on the social spectrum include Marxists, communists, and some radical liberals. The social left holds a liberal position on social issues. Adherents to this position include some feminists, some environmentalists, and some various other liberals, as well as democratic socialists, non-Marxian socialists, and some social democrats. Liberal social policies often include a sense of desire for a non-discriminatory society with little or no religious influence in government and, more specifically, consist of support for gay marriage, support for abortion, environmentalism, stricter gun control, more religious censorship in certain situations, support for universal health care, less strict border control, (modern-day U.S. specific) opposition to the war in Iraq, (in some cases) less spending on defense, less use of the death penalty, (in some cases) support for drug decriminalization, and opposition to school prayer. The social center-left holds a moderate position on social issues, though leaning towards the left (see Social Left). Adherents to this position include some feminists, some environmentalists, and some various other liberals, as well as most populists, most libertarians, and some social democrats. The social center holds a firmly moderate position on social issues, neither leaning left or right. As with the fiscal center and all centrist positions, this may include taking equal amounts of ideas from the left and right, or not addressing the issue at all. 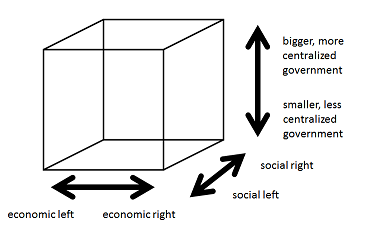 The social center-right holds a moderate position on social issues, though leaning towards the right (see Social Right). Adherents to this position include some neoconservatives, some Christian and religious conservatives, and some various other conservatives, as well as some libertarians. Conservative social policies often include a strong sense of religious moral obligation and, more specifically, consist of opposition to legal abortion, opposition to gay marriage, opposition to universal health care, stricter border control, (modern-day U.S. specific) (in some cases) support for the Iraq war, more spending on defense, support of the death penalty, opposition to drug decriminalization, opposition to gun control, and support for school prayer. The social right holds a conservative position on social issues. Adherents to this position include some neoconservatives, paleoconservatives, some Christian and religious conservatives, and some various other conservatives. There have been a few libertarians in the social right, most notably the late U.S. Senator Barry Goldwater and former congressman from Texas Ron Paul (particularly right-leaning libertarians are referred to as paleolibertarians). The social far right is differentiated from the social right in that, like the social far left, it is more radical, advocates quicker change, especially in society, and often does not wish to bring about said change through electoral processes or democracy. As with the social far left, the social far right wishes to use force to bring about change. Unlike the most of the social far left, however, the social far right often idolizes violence. Nazis/neo-Nazis and fascists/neo-fascists (neo-fascism is not a widely used term) have traditionally been placed on the far right, partly because Hitler so violently hated communism and partly because most (not all) of his alliances were on the right. However, when political experts examine Hitler, they find that when combining his social and fiscal positions, he belongs only a little to the right. When you incorporate his government size position (which will be discussed soon), he stands far apart from moderate conservatives so much that he does not deserve to be called such. It is agreed upon by most political experts that Hitler’s social policy falls on the far right. Klansmen are also considered to be on the social far right, even sometimes qualifying as neo-Nazis, although their fiscal policy is unclear (probably somewhere on the right). Ultraconservatives, like theocrats, are also on the far right, despite having little in common with Nazis. Similarly, ultraliberals are on the far left despite not being communists. Another kind of political classification system is the government size scale, or the authoritarian/libertarian scale. The government scale usually goes up-down, with authoritarian being at the top and libertarian being at the bottom (or, in my case, true dictator being at the top and anarchist being at the bottom). As you go up, you want more power to the government in general, thus making your idea of government “big government”. As you go down, you want the opposite: “small government” or even no government (anarchy). To try to reflect the 7-position system I used for the social and fiscal scales, I will also try to identify 7 positions on the “up-down” scale. The labels I use for each position (with exception to anarchist, authoritarian, and libertarian) are my inventions and are not used commonly or widespread. True dictators want complete control over the nation and government. I distinguish “True dictator” from “Authoritarian” (the next step down; see Authoritarian) in order to make clear the difference in power and intentions. There are some dictators, like Hugo Chavez of Venezuela, that would fit into “Authoritarian” rather than “True dictator” because the difference between Chavez’s power and Hitler’s power is immense. Even the difference between Chavez and Saddam Hussein is big enough to push Chavez down to authoritarian, mainly because Hussein was a malignant dictator, killing many innocent people, while Chavez is not a mass-murderer and may even be well-meaning (although whether his policies have worked is debatable). The common reaction to the word “dictator” is evil, like Hitler. Although Chavez is disliked by many, he is usually not thought of as evil, so he and others deserve a spot somewhere in the realm of “authoritarian”. The exception to this rule is certain communists (Trotskyists and a few Leninists), who may be well-meaning and relatively peaceful, but have/want so much control over the economy and social lifestyle that they have to be given spots in “True dictators”. Totalitarians, a rare variety of dictators, are the highest possible rulers; they have complete control over both the nation and the people. True dictators include very authoritarian dictators, totalitarians, and “malignant” dictators. In terms of political ideologies, Leninists, Trotskyists, Stalinists, Hoxhaists, Castroists, Maoists, Titoists, Nazis/neo-Nazis, and fascists all fit into this category. Famous examples of true dictators or people who favored a true dictatorial government include: George Lincoln Rockwell, Adolf Hitler, Benito Mussolini, Mahmoud Ahmadinejad (President of Iran; works with Supreme Leader Ayatollah Ali Khamenei, also considered dictator) Mao Zedong, Kim Jong-il, Josef Stalin, Leon Trotsky, Vladimir Lenin, Che Guevara, Fidel Castro, Omar al-Bashir, Napoleon I, Kaiser Wilhelm I, Kaiser Wilhelm II, Josip Broz Tito, Enver Hoxha, Pol Pot. Authoritarians want a larger and stronger government. Adherents to this idea include some populists, presidentialists, democratic socialists, most social democrats, most Marxists (except Luxemburgists), non-Marxian socialists, and some more moderate dictators. Moderate centralists hold a moderate position on government size, though leaning towards larger government. “Centralist” in this sense means centralizing government, not holding a moderate, or centrist, position. Advocates of moderate centralism include most American liberals, neoconservatives, and some populists. Government centrists hold a firmly moderate position on government size, neither leaning towards the top or bottom. Similarly to the fiscal center and social center, this includes taking ideas from both sides and balancing them. Moderate decentralists hold a moderate position on government size, though leaning towards smaller government. Adherents to this idea include some conservatives and anti-statists. Libertarians, in the sense of government size, want a smaller and weaker government. Adherents to this idea include paleoconservatives, some various other conservatives, Ayn Rand’s Objectivists (Still another note: objectivists do not consider themselves “libertarians” in the common political sense of it, which often identifies with laissez-faire capitalism and classical liberalism (associated with the worldwide use of the word “liberalism”, see top), on the social scale, but often agree with political libertarians on many things), Luxemburgists, council communists, and self-identified libertarians themselves. Anarchists want extremely little government or no government at all. There are many different branches of anarchism, like anarcho-capitalism and anarcho-communism. There are anarchist parties in the U.S. today, though like almost all anarchist organizations, they do not run candidates for office. A historical example would be the Youth International (Yippie) party in the 60s. There are many other political spectra. One is more of a broad government rule assessment and breaks up all governments into monarchy, oligarchy, democracy, republic, or anarchy. Several have suggested that the extremes of politics (communism, fascism, etc.) are more related to each other than other ideologies put on the same side as them. One famous one, called the Political Compass, is a 2-D, square map with the government scale just discussed on the y-axis and the economic left-right scale on the x-axis. A famous libertarian-authored political quiz called the World’s Smallest Political Quiz uses an equiangular diamond with the positions left, right, statist, libertarian, or centrist available for results. I, Bulbajer, prefer my own design, which I think has been also devised similarly yet independently by a few others. My scale, called the Political Cube, is a 3-D graph where the length of the cube is the economic scale, the width is the social scale, and the height is the government scale. To demonstrate how this works, I will locate some figures on the Cube. Josef Stalin would be on the top, left, front vertex (true dictator, fiscal and social far left). Ron Paul would be 1/6 of the way from bottom to top, 5/6 of the way from left to right, and 2/3 of the way front to back (libertarian, fiscal right, social center-right). The Democratic Party would be 2/3 of the way from bottom to top, 1/3 of the way from left to right, and 1/3 of the way from front to back (moderate centralist, social and fiscal center-left). The Republican Party would be 1/3 of the way from bottom to top, 2/3 of the way from left to right, and 2/3 of the way from front to back (moderate decentralist, social and economic center-right). Document work (excepting the Bulbasaur image and the cube image) © 2009 Bulbajer’s Encyclopedia. The two used images are not mine. Pokémon is a registered trademark of Nintendo. Not unlike the Utne Reader concept that also placed music, book and politician with idealogy and political parties on a full color, 3 d type of chart. Why did you say that Ron Paul was governor of Texas? Woops, thanks for that. It’s fixed now. While I find this to be fairly accurate, I strongly disagree that Adolf Hitler and Nazism is on the Fiscal Center Left, as there is absolutely NOTHING leftist about Nazism. Although he didn’t end up interfering in the economy nearly as much as say a socialist state, Hitler certainly had the power to intervene. Anyway, thanks for viewing! Where would the Green Party be, just curious? I consider the US Green Party somewhere between left-wing and center-left on both the social and economic spectra. As for the government size spectrum, it would be somewhere between moderate centralist and authoritarian. This is how I picture social democratic parties in general. Keep in mind that my model is a US-centric one.